Below you will find a detailed history of Eastleach out home in the Cotswolds, simply click on each of the sections for the complete story, a brief version can be found here. Eastleach Turville was originally a parish on the river Leach 18.5 km. east north east of Cirencester. The village was roughly an oblong shape and comprised 2,630 acres. until 1883 when a smaller triangular area land of approximately 154 acres. on the northern boundary was transferred to it from Little Barrington. That parcel of land was later transferred again to the form the new parish of Barrington. Eastleach Turville was know as just “Leach” at the time of the Domesday survey and the prefix “East” was not widely used until well after the Middle Ages. The village and parish was often called Leach Andrew in the Middle Ages, or Eastleach from the dedication of the church, but the name Leach Turville was recorded in 1316 as this was thought to be the family name of early-13th-century landowners, this became the usual way of distinguishing the parish from its eastern neighbour. The former village known as Eastleach Turville village grew up on a hill overlooking a crossing-point of the river Leach. Greenbury House, now known as Kingshill, was built at the top of the hill overlooking the crossing point of the river Leach and preserved the name Greenbury that was recorded in the year1303 and presumably refers to an earthwork built to command the crossing. St. Andrews Church was built below Greenbury very close to the river, facing Eastleach Martin church; it now appears somewhat set apart from the main village, but there were formerly more cottages near the church. The village developed in a haphazard manner along the hillside and was based loosely on the road leading from the crossing up to the Fairford–Burford road. The cottages were built around a series of pasture closes and small greens, much of the development apparently taking place in the late 17th and early 18th centuries. A recently-built cottage on the close called Playhay in the north-west part of the village was mentioned in 1702, and one built on land taken out of Boleshay, perhaps the later Boltshay at the south end of the village, was mentioned in 1713. Also mentioned in 1713 were two cottages built on land taken out of Perryhay, and land adjoining Crowhay was leased for building in 1725. In 1713 11 tenants had cottages that were built on the manorial waste. Several of the cottages date from the early 18th century, including some which stand on the lane running round the north side of the village, possibly that called Pudding Lane in 1709. A larger number of cottages date from the later 18th century and early 19th, and others, on the main street, were built in the late 19th century by T. S. Bazley, the lord of the manor. One on the south side of the street is dated 1875 and there is a row by the turning to Southrop which incorporates a small clock-tower. A row of five alms-houses was built on the north side of the street by Bazley in 1871 but by 1976 these were used as cottages. In the mid 20th century a small group of council houses was built on the north side of the village in a close called Blunts Hay. The three larger houses of the village are Manor Farm at the west end, which was rebuilt in 1872 but is believed to be on the site of one of the old manorhouses, Troutbeck Farm (formerly known as the Jostle) by the river, is a late-17th-century farm-house extended in the early 19th, and Greenberry House ( now know as Kingshill) , occupying a prominent position on the hill above the church. Greenberry House may be 17th-century in origin but it bears the date 1738 and the initials of Richard and Dinah Boyes, who apparently bought the house in that year. Richard (d. 1771) was succeeded by his son Benjamin, curate of Eastleach, and the house later passed, apparently by marriage, to John Fowler (d. 1864), a solicitor, who may have built the tall Gothic-style wing added on the west in the 19th century. Some of the carved stonework of the new wing is said to have come from Tewkesbury Abbey. In 1955 the old south wing was modernized and refitted. Before inclosure in 1773 the only dwelling outside the village appears to have been the house called Eastleach Grove which stood just south of the Leach close to the west boundary of the parish. It was bought before 1740 by John Howe, later Lord Chedworth, whose family used it as a hunting box until 1774. It has not been found recorded after the late 18th century. Following the inclosure three new farm-houses were built in outlying parts of the parish. Macaroni Farm by the road to Hatherop has sash windows while Macaroni Downs Farm and Eastleach Downs Farm on the former downland are in the traditional Cotswold style. 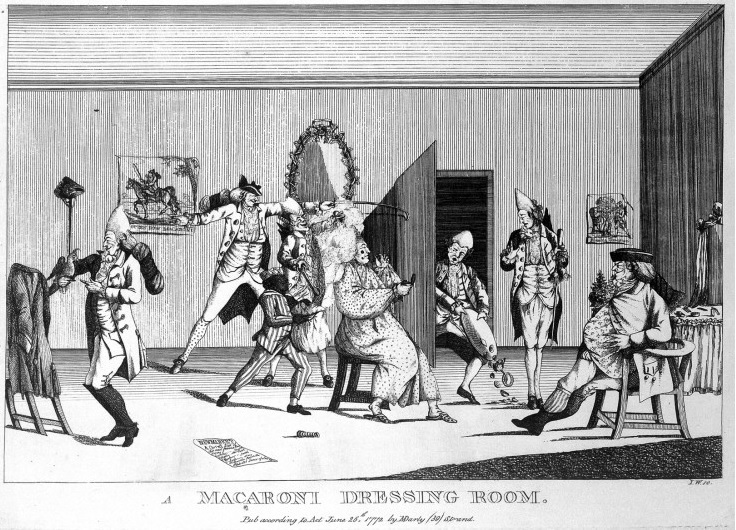 Macaroni Downs was presumably a name used for the downland in the late 18th century, probably deriving, as has been suggested, from the ‘macaronis’, dandies of the period who affected Italian dress; some of them presumably frequented the race-course on the downs in Aldsworth parish. Fifty-two inhabitants of Eastleach Turville were recorded in 1086, and 28 people, some of them from the part of Williamstrip which was linked tenurially to Eastleach, were assessed for the subsidy in 1327. At least 44 people were assessed for the poll tax in 1381. There were c. 50 communicants in the parish in 1551 and 81 in 1603, and in 1650 39 families were enumerated. About 1710 there were said to be 60 houses and c. 200 inhabitants and a considerable expansion of the village was apparently then under way. About 1775 the population was estimated at near 400, and it stood at 370 in 1801. Unusually, the first 30 years of the 19th century saw no rise in population and there was a fall between 1821 and 1831, but by 1841 an increase had begun and the population then stood at 421. It rose to 506 by 1861 and then a decline set in, quickening with the agricultural depression of the later years of the century. The population was down to 299 by 1901 but made some recovery by 1921 before falling once more to 294 at the time of the union with Eastleach Martin. The history of the parish has been dominated by the Hatherop estate, which included two of the manors from 1624 and almost the whole village and parish from the 1770s. T. S. Bazley (later Sir Thomas), owner of the estate from 1867, provided a number of improvements for the villagers, including a water-supply pumped up from the Leach to standpipes, street-lamps put up in 1897, and a readingroom which remained in use as the village hall in 1976. A single innholder was recorded in the parish in 1755 and the Victoria inn, occupying a cottage on the north side of the main street, was recorded from 1856 (fn. 43) and remained open in 1976. The Hatherop Estate, was acquired by the Trustees of The Ernest Cook Trust in 2002 from the Bazley family who had owned the Estate for over 130 years. At the time of the Conquest a five-hide estate at Eastleach Turville was held by Aldwin. In 1086 it was held by William Devereux as tenant under Roger de Lacy, whose father Walter had probably acquired it from William FitzOsbern, earl of Hereford. That part of Eastleach, comprising 2 fees in 1236 and 1½ fee in 1285, remained under the overlordship of the Lacy family as a member of their honor of Weobley. After the death of Walter de Lacy in 1241 the overlordship passed to his granddaughter and coheir Margery de Lacy who married John de Verdun. John’s son Tibbald de Verdun held it in 1285 and was succeeded by his son Tibbald whose daughter Joan, wife of Thomas de Furnivalle, Lord Furnivalle, was later awarded it in her share of her father’s fees. It passed in succession to Thomas’s sons Thomas (d. 1365) and William (d. 1383) and then to William’s daughter Joan, wife of Thomas de Neville. In 1285 an intermediate lordship under Tibbald de Verdun was held by William Comyn and in a half fee of the 1½ Alina de Blakeford held a further lordship between Comyn and the tenants-in-demesne. The intermediate lordship, which also extended over an associated Williamstrip estate and a group of Herefordshire manors, belonged to Richard Comyn and the heirs of William Comyn in 1317 and to William Comyn of Putley (Herefs.) in 1355; it was recorded until 1486. Another part of Eastleach Turville belonged originally to Fairford Manor and apparently formed the two estates with 4 hides and 3 hides and 3 yardlands respectively which Queen Maud granted away from that manor before 1086 to John the chamberlain and one Baldwin. The earls of Gloucester as overlords of Fairford later had rights over two estates in Eastleach. One was grouped with lands in Rodmarton and Woolford in Thornbury to form a fee called Chamberlains. The other, assessed at one fee, was held by Herbert of St. Quintin c. 1205, by William of St. Quintin in 1263, by another Herbert of St. Quintin in 1285 and 1314, and by Herbert’s heirs in 1349, though the St. Quintins only exercised an intermediate lordship over the tenants-in-demesne, a family surnamed Leach. After the death of Earl Gilbert de Clare in 1314 the two fees were apparently subject to some kind of partition between two of his sisters and coheirs, Margaret who married Hugh de Audley, successor to the earldom, and Eleanor who married the younger Hugh le Despenser. Hugh de Audley was said to hold both fees in their entirety at his death in 1347, but Despenser’s son Hugh (d. 1349) was said to hold a moiety of the St. Quintins’ fee and the moiety passed to his nephew Edward le Despenser (d. 1375) whose wife Elizabeth was granted it during the minority of his heir. In 1386, however, Hugh Stafford, earl of Stafford, the grandson of Hugh de Audley, held the whole of both fees and they subsequently descended with the earldom of Stafford. The Manor of EASTLEACH held by William Devereux in 1086 belonged to Sibyl Devereux in 1100. In Henry II’s reign it was held by another William Devereux and later passed to his granddaughter, Cecily Devereux, who between 1201 and 1212 contested with Ralph and William of Lechlade ½ hide which had formed part of her mother’s marriage settlement. Cecily leased her land at Eastleach for 5 years to Bruern Abbey, Oxfordshire in 1216, and she evidently granted part of her manor in fee to Robert de Turville before 1220 when he called her to warrant 12 yardlands to him. Cecily Devereux and Galiana de Turville shared the two fees held from the Lacys in 1243 and the latter was presumably Galiana, widow of Robert Gerbert, who granted a lease of 2 plough-lands at Eastleach in 1246. Galiana’s estate later passed to Bruern Abbey, probably by her gift, and Bruern also received a yardland c. 1250 from Robert Devereux, who had presumably succeeded to Cecily’s estate. In 1285 the abbey answered for three-quarters of a fee held under Tibbald de Verdun and William Comyn while Robert Devereux answered for a quarter. The ½ fee over which Alina de Blakeford then exercised a lordship was shared by Robert and Simon Moryn. Robert Devereux’s manor had passed to John Devereux by 1303 and it later passed to Richard de Wydeslade and his wife Eleanor, from whom John’s widow, Eve, was claiming dower rights in 1329. Richard de Wydeslade (d. c. 1355) was succeeded by his son Stephen. The estate passed to the Leversage family and later became known as LEVERSAGE’S MANOR. It was held by Edmund Leversage in 1407 when he owed suit to the abbot of Bruern’s court for part of it, and Edmund’s widow Elizabeth died seised of it in 1422. She was succeeded by her son Robert Leversage (d. 1464), Robert by his son William (fn. 85) (d. 1485), and William by his son Edmund (fn. 86) (d. 1508). Edmund was succeeded by his posthumous son Robert who died in 1549 when the manor passed to his son William, who sold it in 1559 to James Morris of Little Faringdon (Berks.). Morris also acquired Abbot’s manor in Eastleach and the two manors passed to his son John, who sold them in 1595 to William Blomer of Hatherop. They passed, probably before William’s death in 1613, to his younger son John, who succeeded to the Hatherop estate in 1624. With that estate the two manors subsequently descended. During the 13th century Bruern Abbey acquired a considerable estate at Eastleach, later known as ABBOT’S MANOR. Before 1205 William the chamberlain granted the abbey a hide of land in Eastleach, evidently part of the estate granted by Queen Maud to John the chamberlain. The services due from that land and rent from other lands in Eastleach Turville featured in a settlement made between William the chamberlain and his son William in 1227, but apart from Bruern Abbey the subsequent holders of the Eastleach part of the fee called Chamberlains are not known. As mentioned above Bruern also received the estate of Galiana de Turville and part of the estate of Robert Devereux and at the same period, the mid 13th century, it had other land by the gift of Adam of Bidford, also called Adam the scribe. In 1544 Abbot’s manor was granted to Sir Ralph Warren and others and Sir Ralph (d. by 1557) left it to his wife Joan with reversion to his son Richard. By 1560 the manor was once more in the hands of the Crown which granted it to John Dodington and John Jackson who transferred it immediately to John Dodmore. Dodmore sold it in 1561 to James Morris and it passed with Leversage’s manor into the Hatherop estate. An estate held by a family called Beaufiz during the 13th century may have been a manor and, if so, was possibly that sometimes known as EASTLEACH TURVILLE FARM, which Oliver Cromwell and his wife Elizabeth conveyed to Richard Keble and his son Richard in 1598. It was presumably the son who died in 1636 when the manor, subject to dower rights of his wife Elizabeth, passed to his son Richard. Another Richard Keble held the manor in 1706 and died before 1718 leaving two daughters and coheirs, Mary and Clara. The two daughters married two brothers, Joseph and Henry Bedwell, and Joseph released his share to Henry in 1722, retaining only a part of the manorhouse. Henry died in 1750 and was succeeded by his son Henry who conveyed a moiety of the estate to his aunt Martha Bedwell in satisfaction of debts owed to her as mortgagee. In 1772 Henry and Martha sold the whole estate to Sir John Webb, owner of Hatherop. In 1785 Sir John’s estate in Eastleach Turville, comprising the four manors and the rectory estate, held under the dean and chapter of Gloucester, totalled 2,555 a. (fn. 120) In 1976 the owner of the Hatherop estate, Sir Thomas Bazley, who then lived in the parish at the house called Eastleach Folly, still owned almost the whole of the ancient parish of Eastleach Turville. The sites of the various manor-houses are difficult to identify because of the absorption of the manors into the Hatherop estate. A house called the old farm at the site of Abbot’s manor was mentioned in 1771 and it or the site of Leversage’s manor may be represented by Manor Farm on the west side of the village. The manor-house of the Paunton’s Court manor was mentioned in 1674 but is not identified later. The manor-house of Eastleach Turville farm, which was the home of the Kebles in the 17th century, was described as partly new-built in 1722. The rectory of Eastleach Turville, formerly belonging to Tewkesbury Abbey, was granted in 1541 to the dean and chapter of Gloucester. In the late 17th and early 18th centuries it was leased for lives to the Saunders family. After a partition between the two sons of Frances Saunders (d. 1704) it descended in two moieties, the owners of which sold them to Sir John Webb in 1771. The rectory was valued at £100 c. 1710 when it included 83 a. of glebe, and in 1769 the tithes alone were valued at £203. The inclosure of 1773 allotted 442 a. for the rectory and that estate continued in the tenure of Sir John Webb and his successors to Hatherop, who bought the freehold from the Ecclesiastical Commissioners in 1857. The house belonging to the rectory estate was described as formerly a considerable mansion in 1801, by which time it was ruinous and used as cottages. It was pulled down c. 1875. In 1086 the estates of William Devereux, John the chamberlain, and Baldwin each had 2 teams in demesne and the numbers of servi on the estates were 5, 13, and 5 respectively. In 1291 Bruern Abbey’s manor had 3 plough-lands in demesne, but the general contraction of arable farming was evident by 1341 when 200 a. of the parish that had been under the plough 50 years earlier were no longer cultivated. Sheepfarming probably became increasingly important; the inhabitants of the parish included 2 shepherds in 1381. (fn. 137) Bruern Abbey had had sheep-houses at Eastleach in the mid 13th century when it inclosed a piece of land adjoining them, having bought out the common pasture rights of other landholders, and the abbey had a flock of at least 300 sheep in 1311. Later the right to pasture a flock of 600, known as the ranging flock, was annexed to its manor. The demesne of the manor was let at farm by 1407 but the abbey probably retained its flock and pasture rights in hand, for a later lease of the demesne, in 1454, reserved the use of a sheep-house. The demesne of Leversage’s manor apparently comprised 174 a. of arable in 1422. In the 18th century the Webbs’ estate included two demesne farms called the old farm and the place farm. In 1717 the former, which evidently represented the demesne of Abbot’s manor, comprised 12 yardlands, a few closes, the ranging flock, and pasture for another 660 sheep, while the latter, presumably the former demesne of Leversage’s manor, contained 9¾ yardlands with pasture rights. The yardland at Eastleach was estimated variously as 38 a. and 40 a. (fn. 145) In 1769 the old farm comprised 426 a. of land, the 1,260 sheep-pastures, and 72 beastpastures, while the place farm comprised 307 a. of land, 585 sheep-pastures, and 64 beast-pastures. Later there was a proliferation of small farms and cottage-tenements, no doubt encouraged partly by the large area of common downland and the allotment of pasture rights to the tenants on a fairly generous scale. In 1717, apart from the occupants of the demesne farms, there were 36 tenants on the Webbs’ estate, three of them copyholders and the rest on leases for lives. Two estates of 3½ yardlands and 81 a. respectively, both held by members of the Tuckwell family, were the largest; most of the others were small and several comprised only cottages. In addition there were 11 cottagers who were then excused any rent because of their poverty but in 1723 a few pence in rent was being collected from some of them. In 1769 the parish had a total of 16 landholders. The two big demesne farms and another of 309 a., which included most of the Bedwells’ estate, were the largest; there was another of 276 a. and three others of 100–200 a. In the 13th century Eastleach had two open fields, the north field and the south field (later sometimes called the east and west fields). By the 17th century there was also a third, smaller, field called the Wood field, lying between Akeman Street ( the Roman road) and the River Leach. The three fields originally occupied the whole of the parish south of the Leach except for about 60 a. of meadow and pasture lying in ancient closes around the village. Exchanges were made between the Webb and Bedwell estates to inclose part of Wood field in 1723 and the Webbs appear to have later made exchanges with some of their tenants, but only about 100 a. had been taken out of the fields by 1772 when 1,574 a. of open-field land remained. The common downland, north of the Leach, covered 865 a. in 1772 and provided extensive sheep pasture. Two shepherds were mentioned in 1701 (fn. 160) and in 1769 the farms of the parish had pasture rights for a total of 3,266 sheep. The parish was inclosed by Act of Parliament in 1773. In preparation for the inclosure Sir John Webb bought out several of his leaseholders as well as buying the Bedwells’ estate and the lease of the rectory. He was awarded 1,751 a. for his freehold and 442 a. for the rectory; 7 of his tenants received allotments of a few acres for their estates. There were also 5 freeholders, among whom only the Revd. Benjamin Boyes with an allotment of 98 a. was of any significance and most of his land was exchanged with Sir John for some closes in the village and land in Eastleach Martin. After inclosure Webb’s estate was formed into three big farms, comprising 838 a., 862 a., and 597 a. in 1785. They presumably corresponded to those later called Eastleach farm, Macaroni Downs farm, and Macaroni farm. By 1862 Eastleach farm had been enlarged to 1,435 a., while Macaroni farm had 680 a., and Macaroni Downs farm 293 a. Eastleach farm then included the houses and buildings at Eastleach Downs Farm and Manor Farm (fn. 166) but later in the century it was farmed as two separate farms and the four farms remained the principal ones in the 20th century. In 1976 Manor farm, which included the Eastleach Martin land of the estate, had c. 652 ha. (c. 1,610 a. ), Macaroni farm had c. 202 ha. (c. 500 a. ), and the other two had c. 120–40 ha. ; there were also two smallholdings on the estate. Much of the downs was ploughed up after the inclosure (fn. 168) and in the 19th century the bulk of the parish was farmed as arable. In 1866 2,027 a. were returned as arable and only 394 a. as permanent grass. Large flocks of sheep, returned at 2,422 in 1866, were still kept and were folded on the turnips and grass leys which with wheat, barley, oats, beans, and peas provided the constituents of the rotation; the farmer at Manor farm was known as a breeder of Oxford Down sheep in 1889. There was the usual shift from arable to grass in the late 19th century and early 20th, and in 1926 1,338 a. of arable and 1,046 a. of permanent grass were returned. Sheep-farming continued on a considerable scale but more cattle were also introduced: 529 cattle, including 108 cows in milk, were returned in 1926 compared with 171, including 17 in milk, in 1866. By 1976, however, arable had re-asserted its importance and much of the land was under wheat and barley; sheep and beef cattle were raised in large numbers but there was no dairying. There is said to have once been a mill in the village on the Leach adjoining Troutbeck Farm. It does not appear to have been in existence in 1823, however, when Coate mill in Eastleach Martin was described as the highest on the River Leach. Although only a tailor was listed in 1608, the parish was generally fairly well supplied with tradesmen. Nine families were supported by trade in 1831. The recorded history of stone-working in the parish begins with Simon the mason who was mentioned in 1256, and in the late 13th century and early 14th John the mason was one of the leading freeholders in the parish. John was possibly the John the quarryman who was assessed for the subsidy in 1327. Bruern Abbey’s manor included a quarry for stone tiles in 1535, and masons and slaters were recorded regularly between the mid 17th and mid 19th centuries. Henry Newport, a smith mentioned in 1702, was followed in the trade by others of the family until at least 1823. A family called Clarke worked as carpenters or wheelwrights between 1669 and 1788, and the village had several carpenters in the earlier 19th century, including one described in 1833 as a chairmender. A mercer (a trader in textiles) and a weaver were recorded in 1725. There were usually two or three shoemakers in the village in the later 19th century and that trade, together with those of blacksmith and carrier ( deliveryman) , survived into the 20th century. In the same period the village had several shopkeepers and a single shop remained in 1976. The tenants of the part of Eastleach Turville that was held from the earls of Gloucester attended the view of frankpledge at Fairford. Those from the part held under the Lacys and their successors attended Cirencester Abbey’s view for the hundred; in the early 15th century a single tithingman represented the Eastleach tenants and those of ‘Esthrop’, presumably the associated Williamstrip estate. In 1367 the abbot of Bruern claimed by royal charter the right to a gallows on his manor at Eastleach but the claim was contested by the abbot of Cirencester who caused the gallows to be broken down. Manor court rolls of Abbot’s manor survive for 1394, 1407–14, and 1428, and of Paunton’s Court manor for 1413–26. Lady Webb was holding a court baron for her manors in 1702 and it presumably survived at least until the inclosure. The records of parish government churchwardens’ accounts survive from 1754 and vestry minutes from 1833. The overseers were using 3 cottages to house paupers in 1785 nd a parish surgeon was appointed in 1833. The cost of poorrelief showed the usual rise in the late 18th century but in the early 19th, when the population remained static, the parish was able to contain the cost rather better than most of its neighbouring parishes. Fourteen people were receiving permanent relief in 1803 and 19 in 1813. (fn. 199) In 1836 Eastleach Turville became part of the Northleach union and it remained in Northleach rural district at the time of the union with Eastleach Martin. Eastleach Turville had a church by 1114 when Henry I confirmed it to Tewkesbury Abbey. The abbey had probably been granted it by Robert FitzHamon (fn. 202) , overlord of the part of Eastleach attached to Fairford, though a confirmation to the abbey in 1148 ascribed it to the gift of Robert, chaplain to FitzHamon. The abbey, which had a quitclaim of the advowson from Ralph of Leach in 1287, presented rectors to the church (fn. 205) until 1500 when it appropriated the rectory. The parish was then served by curates provided by the lessees of the rectory estate (fn. 207) until 1762 when augmentation of the living raised its status to that of a perpetual curacy, and from that time the dean and chapter of Gloucester, owners of the rectory estate, kept the advowson in hand. In 1871 it was united with Eastleach Martin, with which it had long been served, and Southrop was added to the united benefice in 1930. After the appropriation the curates of Eastleach Turville received a stipend from the lessees of the rectory estate. The stipend was £13 in 1650 but before 1735 the bishop intervened to raise it to £30. Later, however, it fell to £20 and even that sum was not secured to the curates until 1762 when the lessees agreed to confirm it in response to a benefaction of £200 from Queen Anne’s Bounty. The lessee was paying a stipend of £21 in 1771 when the dean and chapter and Sir John Webb agreed to raise it to £30 to meet a further grant of £200 from the Bounty. That £200 was assigned to the rectory in return for settlement on the curate of an annual sum equal in value to 28 bushels of wheat, and that sum and the £30 were charged on the rectory estate by the inclosure award of 1772. Further grants from the Bounty, each of £200, followed in 1817, 1825, and 1826 and the living was valued at £66 in 1856. There was no residence for the curate in 1750 and 1811 and probably none was ever provided. The medieval rectors of Eastleach included Thomas Shiredge who had leave of absence to study at Oxford in 1362. Thomas Wates, who was found unable to repeat the commandments in 1551, was among the curates who served, usually unsatisfactorily, in the 16th century. In 1572 the church lacked Erasmus’s Paraphrases and the second volume of the homilies and no quarter sermons were preached, and in 1576 the curate was found to have no licence. William Bond in 1593, however, was found a sufficient scholar but not a preacher. Later the poverty of the benefice and lack of a residence meant that the cure was usually served by incumbents or stipendiary clergy from neighbouring parishes. It was being served with Eastleach Martin in 1634 and 1650 and with Southrop in 1661 and 1676. John Fifield, vicar of Coln St. Aldwyns, held the cure in 1743 and after the augmentation remained perpetual curate until his death in 1775. Under his successors, who included from 1775 to 1787 Hugh Price, also rector of Coln Rogers, and from 1807 Thomas Tracey Coxwell who was living with Sir George Berkeley’s family as a tutor in 1813, the cure was left to stipendiary curates who served it with Eastleach Martin. The stipendiary curate R. H. Cooper became perpetual curate in 1851. The church of ST. ANDREW, which bore that dedication by 1282, is built of limestone rubble with ashlar dressings and comprises chancel, nave with north transept and south porch, and west tower. The south wall of the nave is of the mid 12th century and the south doorway has two decorated orders and a carved tympanum. The chancel arch, though partly renewed c. 1884, is of the late 12th century, as is the north wall of the chancel; a blocked arch of two orders in the wall presumably opened into the chapel of Holy Trinity recorded in 1506. The east wall of the chancel was rebuilt in the 13th century and has 3 lancets within an arcade. Later in the 13th century a north aisle with an arcade of 3 bays, the south porch, and the west tower were added. In the earlier 14th century the north transept, which formed an extension to the easternmost bay of the aisle, was added, and a window with flowing tracery in the south wall of the nave is of the same period. The removal of the north aisle and the chancel chapel was possibly carried out in the 17th century; the transept walls were extended to meet the easternmost bay of the aisle arcade and the two other bays were blocked and given plain lights with a single mullion. The north and south walls of the chancel may have been altered at that time and repairs to the chancel were carried out in 1776 when the roof had apparently collapsed. In 1825 the east and west walls of the transept were rebuilt, the old lights being reset. The whole church was re-roofed with local elm, given by G. S. Bazley, in 1906. A window in the transept formerly depicted John of Leach, a priest, and a 14th-century tomb in its north wall had an effigy, perhaps also of one of the Leach family; both glass and effigy had been removed by the 1780s. A reading desk dated 1632 and some old panels, built into the present pulpit, may have once formed part of an old 3-decker pulpit. Some of the pews also have old woodwork, probably from the earlier box-pews. The parish chest of 1678 survives. The carved shaft to the lectern came from Tewkesbury Abbey. The two bells were recast by John Rudhall in 1789. The plate includes a bellshaped chalice of 1733. In the churchyard is the base of a stone cross. The registers survive only from 1654 and the volume for 1748–79 has been lost. The church of Eastleach Martin was granted by the lord of the manor, Richard son of Pons, to Great Malvern Priory about 1120, and it was dedicated by the bishop of Worcester soon after Gloucester Abbey acquired the manor in 1144, full tithes and parochial rights being confirmed to it. Licence to Great Malvern to appropriate the church was granted in 1346 but never acted upon and the living, for which a parson was recorded in 1200, has remained a rectory. In 1385, however, and until the Dissolution an annual pension of 26s. 8d. was owed to the priory out of the rectory. The advowson was exercised by the priory, though in 1304 the bishop collated, claiming negligence on the part of the priory, and the clerk presented by the priory later that year was forced to withdraw his claim in return for an annual pension. In 1554 Sir John Russell presented under a grant from Malvern but later the advowson was exercised by the Crown. The rector of Eastleach Martin apparently retained only one of the five yardlands that Richard son of Pons granted with the church c. 1120 but his glebe probably also included a yardland in Fyfield given to the church by Gloucester Abbey c. 1144. In 1535 he had 48 a. of arable and a small close and he owned all the great and small tithes of the parish. At inclosure in 1753 the rector was awarded 16 a. for his glebe and the tithes were commuted for an annual charge of £133 6s. 8d. apportioned among the occupiers of land in the parish. The rectory house, standing by the Leach some way above the church, was rebuilt by Henry Smith, rector 1688–1702, as a tall building, square on plan, with a hipped roof; various alterations and additions were made later, mainly in the early 19th century. It remained the residence of the incumbent after the formation of the united benefice. The living of Eastleach Martin was valued at £12 in 1291 and at a clear value of £9 7s. 2d. in 1535. It was valued at £60 in 1650, at about £80 c. 1710, at about £140 in 1777, and at £191 in 1856. In 1277 Henry, rector of Eastleach Martin, had leave of absence for 3 years’ study and in 1310 John Caleys had leave to be absent in the service of the bishop of Ely. Baldwin Hyde, instituted in 1458, also held a prebend at St. Mary’s college in Hastings castle. Richard Hill, who held the living by 1532, was deprived in 1554 for being married. Rowland Searchfield, instituted rector in 1601, was later bishop of Bristol. John Wall, D.D., held the living from 1622 until the 1640s but was presumably deprived after the Civil War, part of which he had spent at the king’s headquarters at Oxford. In 1650 the cure was being served by John Soane. Edward Beer was instituted in 1651 and, subscribing at the Restoration, remained rector until his death in 1688. William Asplin, author of theological works, was rector 1733–58, holding the living with the vicarage of Horley and Hornton Oxfordshire. 85, was also rector of Brimpsfield from 1777 and lived at Cirencester. His successor the Hon. Francis Knollys was living on his other benefice at Burford in 1786 resident for part of his incumbency on the grounds of illness. The parish was thus left in the charge of curates for many years. Benjamin Boyes, owner of an estate in the parish and Eastleach Turville, was the curate in the 1770s and 1780s and also served Eastleach Turville, as did the Tractarian leader John Keble between 1815 and 1825 and Rowland Helme Cooper, licensed in 1832. In 1851 Cooper held morning and evening services alternately in each church. He became rector of Eastleach Martin in 1858 and remained incumbent of the united benefice after 1871. Joseph Henry Hodges, instituted in 1880, incurred debts which led to the sequestration of the living between 1885 and 1895; in 1894 he was living in London as chaplain to a refuge for the destitute while a curate-in-charge served Eastleach. The church at Eastleach Martin, recorded from c. 1120, was dedicated to Saint MICHAEL AND Saint MARTIN c. 1144. It is built of limestone rubble, partly rendered, with ashlar dressings, and comprises chancel, nave with north transept and south porch, and west tower. The nave of the 12th-century church survives and retains its original doorways, that on the north (now blocked) being plain in design and that on the south having two orders. The chancel was rebuilt in the early 13th century, when the chancel arch was renewed on the old responds. In the early 14th century the chancel was lengthened and the north transept, porch, and tower were added. The carving of the tracery and reveals of the transept windows is of high quality and the same craftsmen were probably responsible for the east window and for a new south window in the nave. Some minor alterations were made in the 15th century and included a new west window and possibly the tower buttresses and the innermost order to the south doorway. In 1753 Viner Small was given licence to put up a seat in the north transept and the transept was appropriated to him and successive occupants of the manor estate. A gallery at the west end of the nave was removed in 1864 when some slight restoration was carried out. A more thorough restoration was done in 1886 when the nave was re-roofed. The nave retains some 16th- and 17th-century pews and the parish chest is dated 1662. The font has an octagonal bowl of the 15th century. In some of the windows are fragments of medieval glass. Two of the three bells are of early date, one possibly of the late 14th century and another by the early-16th-century founder John White of Reading; the other bell was recast by Abel Rudhall in 1739. There is also a sanctus bell of 1616. The plate includes a chalice and paten cover given by the rector Henry Smith in 1689. The base and part of the shaft of a medieval cross stand in the churchyard. The parish registers survive from 1538. Baptists registered William Eyles’s house at Eastleach Martin in 1775 and their meetings, later held in William’s barn, continued until at least 1811. In 1825 it was said that there were no dissenting meetings in the parish and none were recorded later. A barn in the Eastleash Tuville registered by a Lechlade minister in 1813 and houses registered in 1824 and 1827 were either for the use of Baptists or of Primitive Methodists; the latter sect built a chapel near the western entrance to the village in 1829. In 1851 afternoon and evening congregations of 90 and 110 respectively were claimed for the chapel. In 1870 it was no longer in use but the congregation had been revived by 1885, when the village also had a Plymouth Brethren chapel. The building of a new Primitive Methodist chapel in the south part of the village was begun in 1900 though it was not opened until 1909. It had gone out of use by 1976 and had been converted to make a house. By 1818 day and Sunday schools had been started for teaching the children of Eastleach Martin and Eastleach Turville together. The schools were in union with the National Society and were probably supported by the curate John Keble but in 1833 Eastleach Turville had its own parish school, supported by subscriptions and school pence; 30 children attended and there were boys’ and girls’ Sunday schools associated with it.In 1847 49 children attended the parish school and the schoolroom was said to be virtually secured. In the same year (1833) a small private school, teaching another 24 children, was started in the Eastleach Turville. In 1826 a new day-school was started at Eastleach Martin, apparently for that parish alone; in 1833 it was supported by subscriptions and weekly pence and taught 31 children. There was no secured schoolroom, however, until 1863 when a National school to serve both Eastleaches was built in Eastleach Martin east of the church. It had an attendance of c. 75 at the outset, rising to 90 by 1885. In the early 20th century the attendance was c. 70 and in 1936 it was 59. In 1974, when the number on the roll had fallen to 9, the school was closed and the children transferred to Southrop. The school house has now been converted to dwellings. Thomas Howes of Eastleach Turville (d. 1760), a sheep-dealer, left £25 to provide bread for 20 poor people on Easter Sunday. The principal was put out on private security until 1827 when it was deposited in the Cirencester savings bank. Henry Smith, rector of Eastleach Martin50 in 1702, the profits to be given to 5 poor people on St. Thomas’s day. The principal was lent out to private individuals and the interest was apparently regularly distributed later. In 1970 both the charities were amalgamated and the joint income of c. £4 a year was allowed to accumulate to await particular cases of need.